Essential Statistics for the Pharmaceutical Sciences is targeted at all those involved in research in pharmacology, pharmacy or other areas of pharmaceutical science; everybody from undergraduate project students to experienced researchers should find the material they need. This book will guide all those who are not specialist statisticians in using sound statistical principles throughout the whole journey of a research project - designing the work, selecting appropriate statistical methodology and correctly interpreting the results. It deliberately avoids detailed calculation methodology. Its key features are friendliness and clarity. All methods are illustrated with realistic examples from within pharmaceutical science. 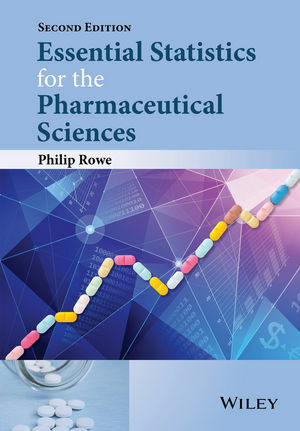 This edition now includes expanded coverage of some of the topics included in the first edition and adds some new topics relevant to pharmaceutical research. all examples set in relevant pharmaceutical contexts. key points emphasised in summary boxes and warnings of potential abuses in ‘pirate boxes’. An invaluable introduction to statistics for any science student and an essential text for all those involved in pharmaceutical research at whatever level. Philip Rowe obtained a BSc in Physiology & Biochemistry at Reading then an MSc in Steroid Endocrinology at Leeds and a PhD at Liverpool University. Then held a post-doctoral fellowship in the Department of Pharmacology and Therapeutics at Liverpool working on the pharmacokinetics of oral contraceptives. In 1980, moved to the School of Pharmacy in Liverpool John Moores University and is now Programme Leader for the Master of Pharmacy programme and Reader in Pharmaceutical Computing. ?Various research interests have provided experience in a wide range of data analysis techniques. Has spent the last thirty years developing teaching approaches that allow an appreciation of essential aspects of statistics and pharmacokinetics for the non-mathematical. Apart from teaching these subjects to a wide range of students, also has considerable experience of presenting this material to professional?bodies and industry.